It is not until after college do we learn how truly important that time in our lives was. It was a time of discovery, bonding with those who had similar interests, and experiencing moments that will never be duplicated. After those four years, sometimes more, pass you by and you're stuck in the real world, nothing is ever the same and there is not one thing you would not do to go back to that time of freedom. 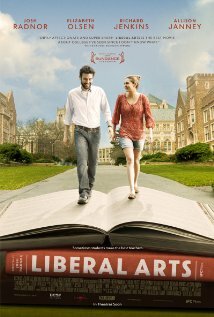 Liberal Arts is Josh Radnor's (How I Met Your Mother) second effort behind the camera as a director and he delivers an emotionally gripping, mentally stimulating, and often humorous film about life after college and that desire, no matter how flawed it may be, to go back to school. The film centers around Jesse Fisher (Radnor), who receives a phone call from a retiring former instructor, Professor Hoberg (Richard Jenkins). Hoberg wants Jesse to come to the retirement dinner and say some kind words about the polarizing professor. Driving from New York City back to his Ohio-based university, Fisher meets up with his old professor and comes across the family of a gifted and intelligent young student, Zibby (Elizabeth Olsen). Jesse finds himself enamored with the incredibly mature Zibby, who is only a sophomore at the university where she studies drama. While he knows his association with the girl could be called into question, Jesse picks and chooses his spots to talk and hang out with Zibby. Throughout his weekend, he meets two other college-aged kids who spark his interest. The first is Nat (Zac Efron), a hippie of sorts, just on campus to visit a friend. He and Jesse form a bit of a spiritual bond and Nat acts as a bit of healer when it comes to Jesse's personal problems. The other student Jesse meets is Dean, a gifted, but scared student who shares the same love for Jesse's favorite author. Dean is emotionally damaged and does not feel a sense of happiness on campus. Jesse can see the young man struggling and offers his assistance whenever possible. The key storyline is the relationship between Jesse and Zibby. It is a taboo relationship where the older male is speaking quite frequently with the younger female. There is even a scene where Jesse maps out the age discrepancy and it is a humorous, but also reality check moment for the protagonist. While these two have an up and down relationship, what they teach each other is invaluable and make each other better for their upcoming futures. If you've seen The Last Kiss starring Zach Braff (Scrubs) and Rachel Bilson (O.C. ), it is a very similar film, but does have its differences. Josh Radnor is an exceptional director (happythankyoumoreplease) and his voice, while it mimics other films and concepts, does have an originality to it and a genuine emotional connection with the viewer. Elizabeth Olsen is fantastic in this role and she, along with Radnor, have a phenomenal chemistry on screen. I cannot recommend this film enough; go watch it immediately!